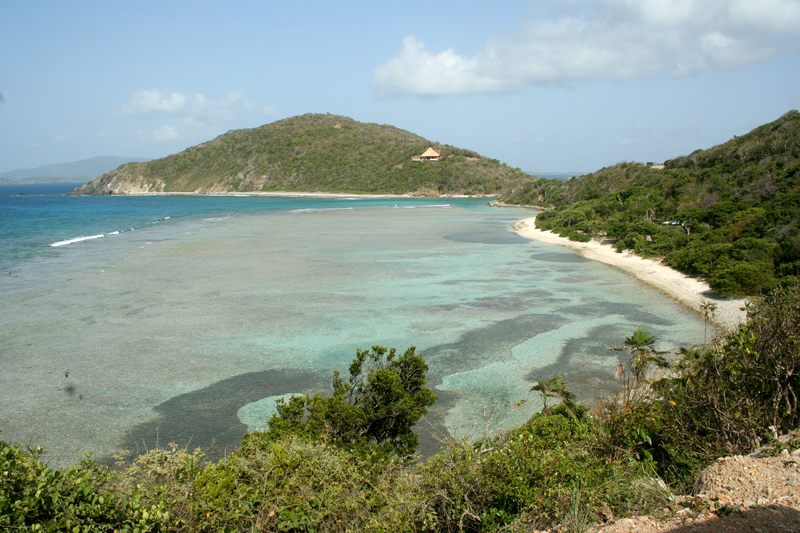 The BVI is the epicenter of fun in the Caribbean, and Scrub Islands Sunshine Madness is a fine way to start! In the Caribbean beautiful blue water, warm tropical breezes and a slow appreciative way of life are assumed, old news. What is new though is a private island, the first new project the BVI in 15 years, where you can design your own fantasy get away from the world left behind. Amid the many pristine white sand beaches, 4 restaurants in different locations, coral reefs, pools, kayaks, yachts, fresh seasonal foods, you can choose sailing, snorkeling, spa treatments, fine or casual dining, fishing, kayaking, hiking or just doing nothing in style. Fortunately there is also a talented staff to help you put together an itinerary to make your fantasy come true! They are serious about these custom itineraries, so wind up your imagination because everything is possible here in paradise! Glorious bathroom to the left, french doors to the porch over the harbor, luxury bedroom in between. 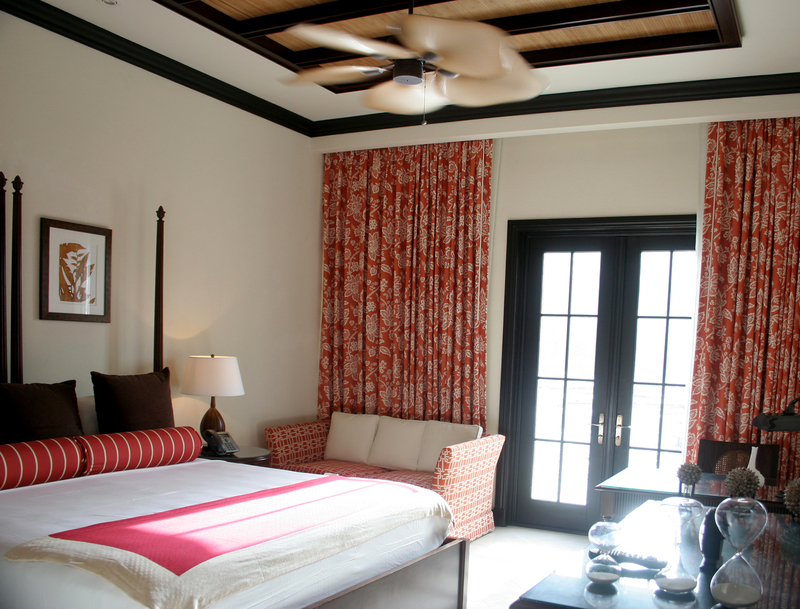 I love beautiful high ceilinged rooms with slow turning fans and comfortable, graceful furnishings. I adore huge luxurious tiled bathrooms and beds that are so comfortable that you think about them over dinner and linger beyond reason in the morning. 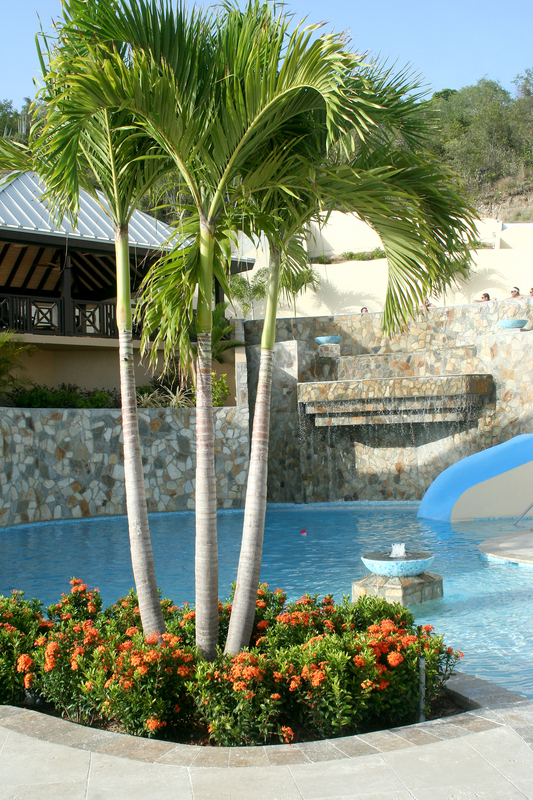 Pools with infinity edges, swim up bars, fountains and even water slides are delicious. Mainsail’s new Scrub Island has all of that, plus the unique quality of being a self contained island. My favorite is a beautiful restaurant that hangs over the lower pool, and also has a swim up bar. 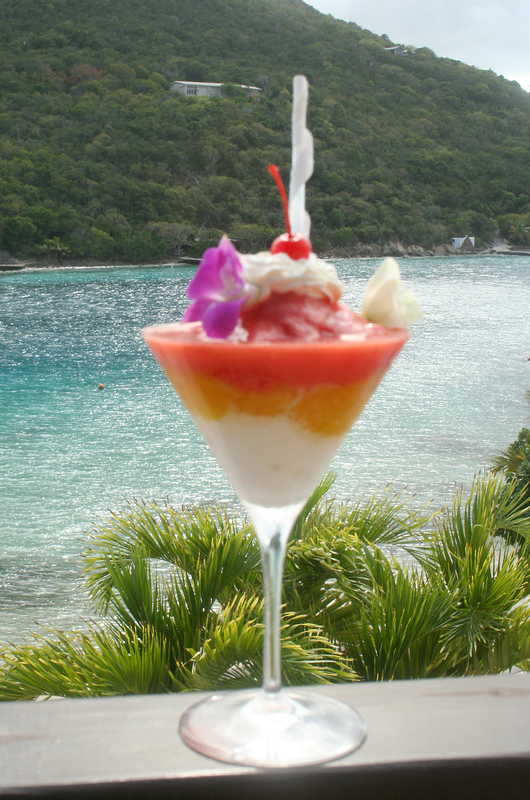 It is hard to describe the feeling of indulgence when you float slowly with your fresh fruit & rum drink in hand. It is impossible to believe that there could possibly be a phone call demanding your attention somewhere in the world. One Shoe Beach has been left in its natural coral reef state, but with bar service. 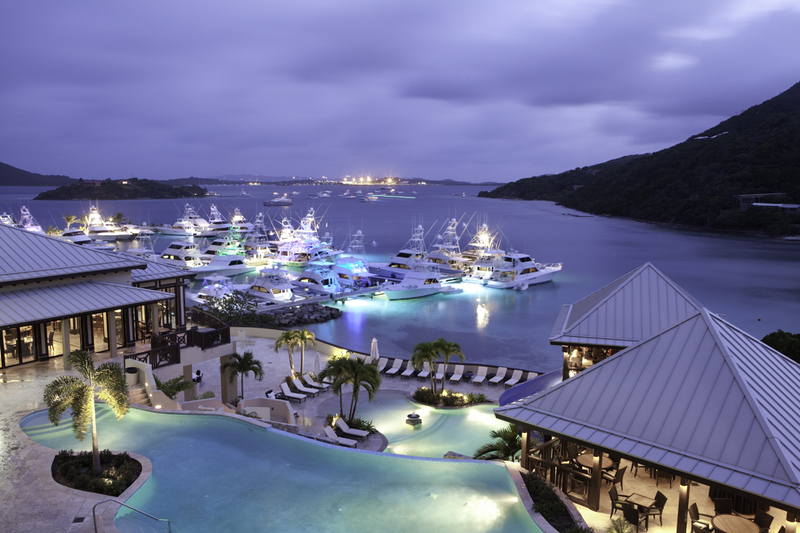 To me the distinction that I found on Scrub Island was the job that they have done at integrating the un-contrived nature of the island with the ability to offer a luxury guest experience. They have accomplished a nice blend of celebrating the beauty of the natural Caribbean, while enjoying the enhancements of 4 distinctively different ways to dine through the day plus the pools, the spa, and the interesting mix of public and private spaces that they have created. Scrub Island is an arena for you to decide on your own perfect island fantasy, the kind that warms your mind while you are donning your winter coat. It is the experience that will whisper in your ear, reminding you that there are alternatives to shoveling snow! I really appreciated the beautiful area that they opened up for weddings as it juts out into the Sir Francis Drake Passage. A level area that can be decorated with tents and flowers and chairs if you wish, or you can be wed there in the simple elegance of the Caribbean islands. Mainsail’s approach to letting that be the magic rather than trying to fabricate it shows wisdom that is not found at every destination resort. 2 Restaurants facing the harbor at night. Additionally, Scrub Island has a network of private residences along the harbor that you can rent for a wedding party of almost every size! Romance abounds here, you would have to work really hard to ignore the simple beauty and natural comfort of everywhere you turn in the Caribbean. I was also surprised at how easy it was to get to Scrub Island. Fly to Beef Island on Tortola, and they pick you up in their own private ferry for the mile long cruise across Trellis Bay. Arriving by boat couldn’t be much easier, there are 3 channels into Trellis Bay and many slips waiting. From that moment on, you make your own fantasy on a private island in the paradise of the Caribbean.